Dresses are usually my favorite clothing item because they are so easy to put on. But sometimes you get bored of the one fabric all over. 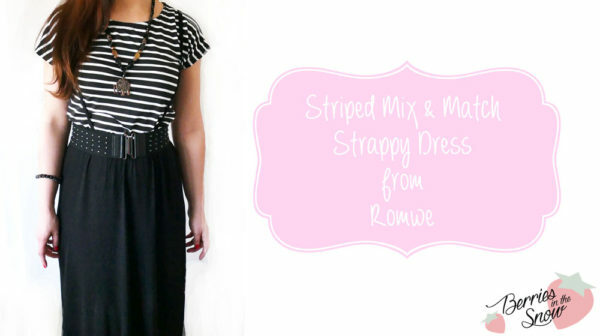 For such occasions a mixed dress is great, like this Striped Mix & Match Strappy Dress from Romwe. It looks like a two-piece but still is an easy one-piece. Romwe is an online fashion retailer with the saying “from runway to realway”, sellingfashionable clothes for affordable prices. They ship internationally, and you will find very unique fashion items there from time to time. Just have a look at my previous review for the floral pleated skirt. I love striped black and white items, they have some kind of happy vibe, I do not know why. 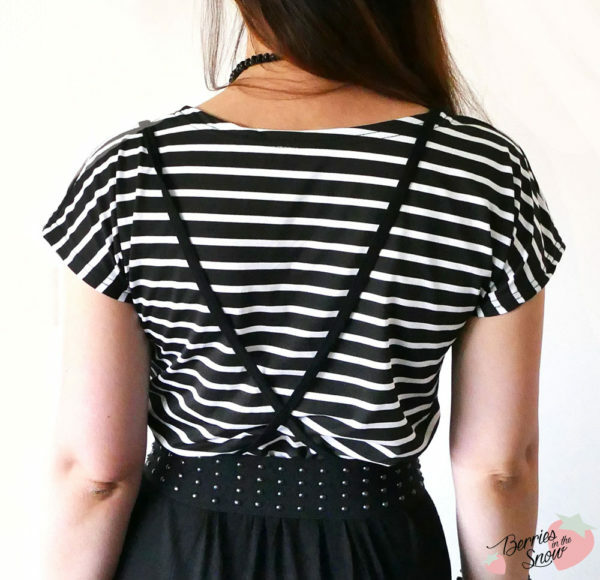 The upper part of the dress also has some attached straps, which make the dress quite cute looking. The straps are loose, so they won’t be fixed on the shoulders. You can cross them on the backside. 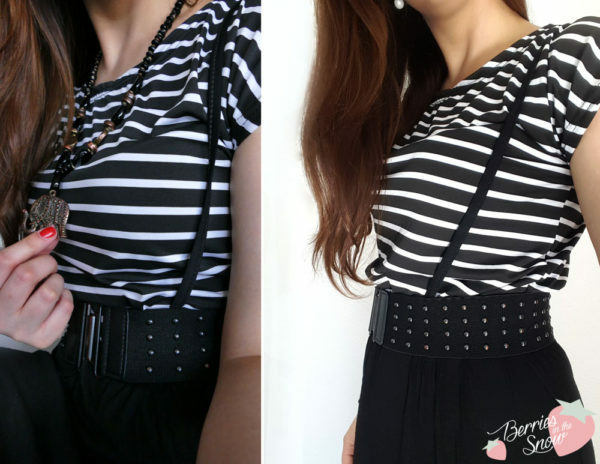 The belt is not part of the dress, by the way, but I think that this dress looks best when worn with a belt. I also love to combine it with a necklace, like the elephant necklace above. 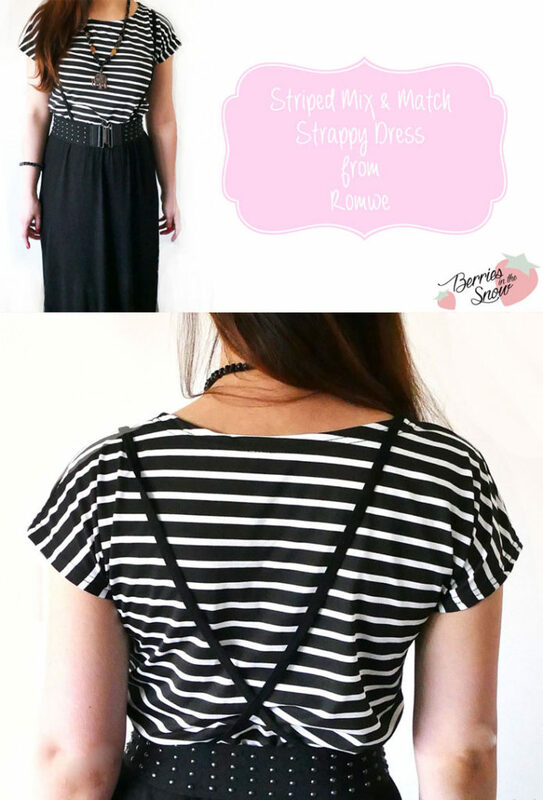 The lower part of the Striped Mix & Match Strappy Dress is plain black and has a straight shape. Here I have to point out that from the image on Romwe you might think that this dress has a A-shape dress, but it hasn’t, and if you planned on buying this dress because of the A-shape you might reconsider it. The length of the dress is long, but not a maxi, still it goes over the knees. It looks very pretty combined with flats. 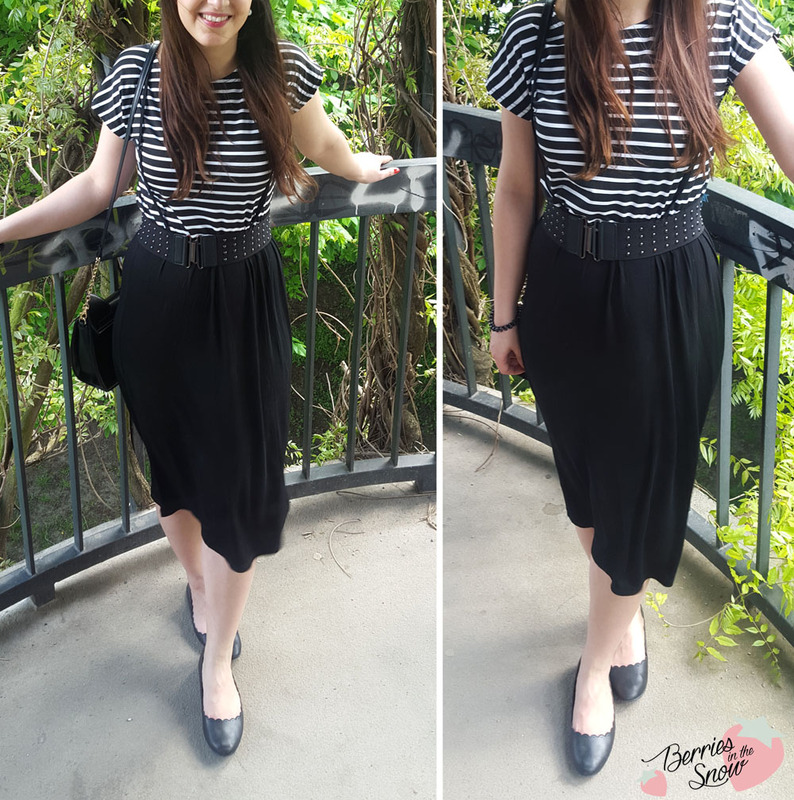 The Striped Mix & Match Strappy Dress retails for 12.99 US$ from Romwe. It is available in different sizes, S, M, L and XL. I ordered it in size M and it fits perfectly. Since the material is partly stretchy, especially at the top. I think that S might have worked for me aswell, but with asian online sizes I’m always safer with one size larger. The description says the material is cotton, but I think that the upper part is made from polyester, too. The lower part looks like cotton and has a thin material, so this dress is mainly made for summer. You can check out my Spring Wishlist for some of my other fashion inspirations from Romwe. How do you like this dress? Do you have similar two-fabric dresses? Just as a short reminder: All products mentioned and reviewed on this blog are of my personal opinions. This product here was sent to me for reviewing purpose by http://www.romwe.com/ which doesn’t influence me in providing my honest opinion on the products. Hahaha, you’really right. And the Tshirt is included and sewn in, so it is really easy to wear.